Boston: "The bible is very inconsistent and various Christian sects interpret it differently." B. Deacon: "The truth is not fluid, the interpretations are." LOL. What a load of BS. The interpretations have always been CONFLICTED. "Truth" indicates OBJECTIVE truth which no one has even proven. That's the main problem with Christianity: conflict and division – and they hide behind BS called "objective" blah blah blah. But this is the problem with a certain brand of critic: they need to stop taking positions that can be shot down with the story (appropriately, Hindu) of the blind men and the elephant. Amazing how god(s) use evolution, isn't it. I believe that its not what you believe in that will determine if you will be saved. I believe it depends on your soul and how you are viewed overall. If you are viewed as a heartless christian who hates gays and non-believers (ex. Westboro Baptist Chur... *ahem* I mean Hate Group), then you will probably not be saved. However I have a friend who told me he is a atheist, however he seemed a bit unsucure about that. He is my best friend of nearly 10 years. He has one of the brightest characters I've ever seen. I would be ashamed and shocked if he went to hell. I really think if the Christian (and other communities overall) view someones character as positive and good-willed, they can be saved. I am a strong believer and wouldn't use someones beliefs as a judgement for where they will go, but their overall character. CNN, you mean "core tenet", not "core tenant", unless you are talking about someone living inside a core. Michael John Anthony, thanks for providing that deep insight. What's your take on the solution to the incorrectly replicating chromosome dialectic problem? Does it need relativistic corrections? This is why proofreaders should be paid more. "Those who know Your name will trust in You, for You have never forsaken those who seek You." That verse isn't from the bible that the Pope read from. The Pope is spreading false doctrine. Has he read the Bilble? How can this guy lead people when he doesn't know what the Bible teaches. I would not follow this guy nowhere. Is there any person you would follow in belief? The atheist must have a strong faith to believe that there is absolutely no God or Heaven. where did that proof come from? I can look at creation all around me and see that it is too big and too intricate to have just evolved or appeared from nothing. To look at the stars in the sky on a clear night or the sun shining bright during the day and say that it was formed from nothing is stupid. It would be the same as looking at a building and saying that there was never an architect or builder. Im sure that this comment will draw alot of hateful replies and remarks but the truth remains that Jesus is the One True God and the only one that can redeem a person. The pope is leading alot of people away from the truth. Many are lost and few will find the narrow way that Jesus describes in His word. Only Jesus can save a person. Not the pope, not Muhammed, Buddha, Confuscious or any man made religion. Oh kiddo, this old canard? What you are looking at is an effect and saying there was a very specific cause without evidence. Just because there are intricacies in the universe in no way implies that there had to be a good to create those complexities. Try again, this time without committing any fallacies. Xtianity is not a man made religion ? Looker: you must not been born of a woman. You just don't get it do you? Atheists don't believe in anything. Believing in nothing is not a belief. Post by ' luker6401' contains an instance of the Argument from Ignorance Fallacy. Yeah....we get it...it's like the old George Carlin line "my god has a bigger d**k than your god." GET REAL! "Big" is relative. I'm sure an ant thinks your car is big too, but I'm sure they would think a "God" built that car too, right? i am sorry that you cant wrap your head around the concept and have to fill the gap with the idea of magic and supernatural beings. This atheist doesn't think god's existence or not is a provable thing at our level of development, its not a relevant point. If no man made religion (which is all religion) can save, which one should a person associate with? Ok, let me get this straight. The Pharoah wouldn't do what God wanted him to do, so God killed all of the "first born sons of Egypt". It never occured to God to just kill the Pharoah? Are you sure he was the "architect" of the universe? He doesn't really seem all that bright to me. Maybe some other, smarter god was the "architect", and the Christan god was just a subcontractor? 'Ok, let me get this straight. The Pharoah wouldn't do what God wanted him to do, so God killed all of the "first born sons of Egypt". Not to mention that apparently he needed markers on houses so he knew not to go there. Atheists do believe in 'something'. We believe in the power of people to solve their own problems. We believe that, as well as people can be the most evil, that people can do the greatest good. We believe that we have have the right to determine the purpose & course of our own lives. We do not say we believe in nothing because then we are letting you define us, your beliefs are "something". Wedefine ourselves by what we are, not by what we are not. Also, as far as saying there is no proof there is no god: The burden of proof always falls to those making the claim. I do not have to prove that the moon is not made of green cheese, you have to prove that it is. It is impossible to prove a negative. Even IF (And I don't) but IF I gave you that the Universe had a Creator – you still made a gigantic and unfounded leap to say it was the God of Christianity; God the "Father" of Jesus Christ – that made it. Keep in mind, every religion ever made – all said "their" God made the Universe. What makes Your God and Jesus Christ the one that made This Universe? Because He Said So? Did He even say so or just the Old Testament that said there was Light before there was a Star..?? The teleological argument doesn't work in an abstract sense. Most of these comments here barely pass for informed, though-does anyone really think it's significant that the Hebrews represented God as needing talismans? Of course they did. Our humanisms' partakers of Celestial Life Ordainments seems to avoid scripture that states quite succinctly that the kingdom domains of Godly reservations lays upon the insides of all Celestial Life Manifestations. From wherein does lay the Godly of Gods; all of them being our bodies' husbanded beneficiaries by which they take safe harborages inside all Celestial Life and reap from our digesting ways all things needed for their Godliness Lives to endure and maintain our bodies' welfare issues. Surely the Gods who made us all from their inside husbandry perceptions are not without making physiological mistakes now and then! These atomically based beings of godly perspectives can only imagine what their atomized constructs will look like and they hope their Celestially Manifested Beings will all be Heartfelt Celestial Constructs of pleasurable conditionings! Why don't you try building things atom-by-atom? God and God's families and His brethren living within the atomized cosmos have a really hard time building our cellular mainframes from the insides out! Are you equating heaven being as real as a round earth? I would like to know from Speckahrdt or any other athiest intellectual what is the moral reasoning to do good or put another way why should we not be cruel or evil. There is absolutely no explanation. The bs line "humanists have been saying for years that one can be good without a god" while I do not disagree I can see no reason by any athiest why I have to be good. I want to know why I should not be cruel. If there is no God and there is nothing different between me, you and the rocks on the ground why not do whatever I want? Our morality comes from doing unto others as we would have them do unto us. We don't do it out of fear of a boogy man in outer space or do it for some reward–we just do it. Does your Christianity so blind you to this simple truth? Have you been SO dumbed down by your religion that you can't understand this? You can do what ever you want J, as long as you are responsible for your action, J. Don't do evil things J, and hope that saying Hail Mary 9 times will get you into heaven. Committing heinous actions results in social discrimination and isolation, which is extremely detrimental to survival. The most obvious answer is self-interest. No I am not religious at all. Agnostic actually but I enjoy philosophy and I cannot find a single athiest writer who can put forth a moral reason why not be cruel/evil. So you are only nice to people so they will be nice to you? What if you are nice to me and I do not return in kind. Kind of blows your arguement. It's a little simplistic to cite the Golden Rule when outside the context of modern religion it was usually stated from the negative side: i.e. don't do what you don't want done to you. How would a humanist tradition be consistent about the fine distinctions that are needed in practice? That is too simplistic a break down of it but actually it proves the argument because now that I know how you are then that will change how I interact with you in the future and thus you injure yourself. It's not really that hard. Most posts have been saying the the "long" way as the Golden Rule. It's called Empathy. It's an instinct and has allowed humans to survive. An individual human will not survive. We survive only in society's that help each other. This is why the USA is the best nation on earth – we help each other and value differences which make us stronger. By the way, recent research has shown that animals too have Empathy (Do they have God??) Most often showed when a female "adopts" the newborn of another female (and sometimes even of another species). This never has any real benefit to the adopting mother. It is entirely an act of empathy. I am agnostic bordering on being an atheist and I would ask you why you need a reason to be morally 'good'? Ira- you do realize that saying your morality comes from doing unto others as you would have them do unto us, is from Christianity, don't you? You don't realize where your morals have come from. The Bible does not teach this and if the pope is supposed to be God's representative on earth, he should know that. Bible says salvation is by faith and acceptance of Christ as saviour. Specifically says NOT by works or deeds. The pope has a special book that no ordinary Xtian can ever have access to. How is faith and acceptance not a work or deed? How did you come to "believe"? Was it a gift (something God gave you, but not to others?) or did you do something? Why did God give you the gift, but not the Pope? 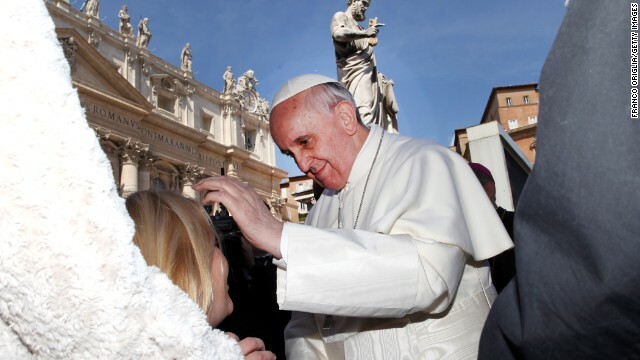 The Pope was crystal clear "that salvation is only through Christ’s Sacrifice. In other words, he is not suggesting – and I think some are taking it this way – that you can be saved, get to heaven, without Christ." The Bible didn't ask the question of what to do with people who hadn't the opportunity to know Jesus, though. We might reasonably project that they are exempt from any punishment for that. From there a lot is determined by how one defines "opportunity." Does someone raised in a godless household have the opportunity? Well, obviously, this is not meant to be taken literally. It refers to any manufacturers of dairy products. I know this is funny, but I don't get it. Life of Brian, yo. Life of Brian, by Monty Python. Jesus Christ is the only way to the Father and to Heaven. One day every knee will bow, every tongue confess that He is Lord regardless of whether you have trusted in Him or not. Jewx, Xtians, Muxlims is fighting about this on Earth for the last 1500 years. It will be interesting to find out how long the fight will last in heaven and who will win in the bloody end. Jewx, Xtians, Muxlims is fighting about this on Earth for the last 1500 years. It will be interesting to find out how long the fight will last in heaven and who will win in the bloody end." Not I. If there is a hell then that is where all the rock and rollers, all the movie stars, the better majority of the great poets and thinkers are. While your on your knees kissing jebus where he wants to be kissed you can hold my coat, I understand I won't be needing it. Many atheists, and even nonpractising Christians have a poor understanding of Christianity. An issue here is the confusion over the meaning of the word "redeemed" verses the meaning of salvation. Christ indeed redeemed everyone, but not everyone will attain salvation. There has been a misunderstanding of what the Pope meant by atheists are redeemed. I'm an atheist, and I like this guy. Of course, I still think he's wrong about there BEING a heaven (so thanks, but no thanks), but he's obviously a good soul. Of course, I still think he's wrong about there BEING a heaven (so thanks, but no thanks), but he's obviously a good soul." I was born in a non-Christian country and indoctrinated into a competing religion from a young age. I had a Christian missionary, but he had a speech impediment. Can you confirm that i will go to heaven if I believe in Lord and Taylor? 10 For with the heart man believes unto righteousness; and with the mouth confession is made unto salvation. 11 For the scripture says, Whosoever believes on him shall not be ashamed. 13 For whosoever shall call upon the name of the Lord shall be saved! What did Jesus think about cut and paste? Which section of the bible covers that? He seems like a nice god if you are a sociopath. And please hush up, men are taking. You wouldn't want to offend god would you? God's love towards man made Him to send His only Son Jesus, to die the shameful death on the cross in order to reconcile man back to God! We must not forget that though God is LOVE, God is also a CONSUMING FIRE! God extends His hand of fellowship to ALL men on planet earth but SALVATION on come to THOSE who believe and receive Jesus Christ as Lord and Savior. It does not matter what you are told, even if the messenger is an ANGEL of God, God made it clear that "Not by works of righteousness which we have done, but according to his mercy he saved us, by the washing of regeneration, and renewing of the Holy Ghost". "Neither is there salvation in any other: for there is none other name under heaven given among men, whereby we must be saved"
It does not matter what you choose to believe, it is appointed unto man once to die and after that, the judgment. You can either choose to live by what the bible teaches or you can live life your own way. It is YOUR choice! One day, you will wake up and find out if God is a joker or not! Let us make hay why the sun shines. There is no repentance in the grave! Once you die, it is FINISHED!!! No more chance of redemption! My totem pole says you can go to heaven even if you don't believe in my totem pole. your god sounds like a right violent nut. We must NOT forget that using RANDOM CAPS, and LOTS of exclamation points makes EVERYTHING we SAY true!!!!!!!!!!!!! and MUCH more CONVINCING!!!!!!!! Last time I check Jesus said he was they only way. Pope be a little confused. True. Jesus is the Way, the Truth and the Life! As much as human feelings may want to disbelief this, THERE IS NO OTHER SALVATION OTHER THAN THROUGH THE BLOOD OF JESUS SHED ON CALVARY!!! Where did Jesus say that? That's because you're reading the wrong book. Those gods that men make are a vain lot, including the Christian storybook one. Funny, always wanting worship of just themselves. It's always a good clue. The bible is very inconsistent and various Christian sects interpret it differently. Christians on this blog differ greatly on the pope's statement. Religion is about truth, but you guys can't agree on hardly any of it. If truth is that fluid, how do you trust any of it? the truth is not fluid Boston, the interpretations are. As fluid as Joel Osteen's hair ? Christians have more denominations than you can shake the Bible at, each with their own interpretations. In fairness, it's only a few groups that assume that only they have the true form of Christianity. We are imperfect beings. All of us. Of course we won't get it right. God wants a relationship with us. It is love. That's Romans 3:4, not Galatians. You should read your Bible more. Boston, you say: "The bible is very inconsistent." Sigh. O.k. give us one example. Yes, I'm sure your internet sources will allow you to cut and paste many supposed ones, but I don't have the time nor the inclination to address all of them–so pick your best one and I'll prove you wrong. OMG, how can a "god" be in "want" of anything? As imperfect beings, you could easily have gotten this whole thing about God being actually real completely wrong, correct? Inconsistencies run the gauntlets of our shelled beliefs. None of us are exactly of the psychologically egoistic sameness let alone our physiologies are all made with little differences of latent similarities and yet they are different and are of sameness. Go figure! Conversation, how is it that your "god" made a guidebook that lends itself to such conflicting interpretations? Seems a pretty weak god you've created. I'll go for Aphrodite over that Christian fool of a god anytime. Sammy, thanks for the correction..... Regardless, Christ is right and the Kingdom of Heaven is "not of this world" because it will pass as He said. We are to look for a New Heaven and New Earth as the present Creation awaits "fire" to be burned up with "fervent heat" (II Peter somewhere....). Kake...you ask an interesting question (how can God be in want of anything). We use the term "want" because it is the only human word we have to describe the "thing." God may very well have a different emotion about it–something we can't explain. Don't read too much into the word "want"–its based on human limitations, not God's. @ As imperfect beings, you could easily have gotten this whole thing about God being actually real completely wrong, correct? Yes. We can't fully comprehend God. This is a good thing – we need a God who is greater than our ability to understand Him. That also means that every person who ever "experienced" God, the people who wrote the bible, and every person who has ever interpreted it was also imperfect. So, why would you ever trust any of it? Kake...are you really asking me why God is responsible for our own lack of wisdom, and more often, intellectual laziness? More to the point, what did the people who wrote the books and their various audiences understand? We are separated by thousands of years of language and changing culture...there's going to be some confusion for those who don't undertake an intensive study. Yea, Jesus is the only person in the Bible that is supposed to be perfect. The Bible is not my God – but it points to God. Jesus lives. I have access to him today. Why would anyone ever put their trust in something that they cannot fully comprehend? Why do you get to define a God who is beyond our ability to understand? In truth, we may understand what God actually is very well. You may not like the answer, but that wouldn't prevent it from still being the truth. Since I'm imperfect I need help from a perfect being (God). What do you fully comprehend in this world? Jesus lost his temper in overturning the tables of the moneychangers. He wasn't able to convince more than a handful of people during his lifetime. I really don't see how you can argue that he was "perfect". If you place the Bible above actual truth then you are worshipping it like some idol. The Bible could point to any of several dozen different versions of God; how do you choose? Jesus died. You assume that he was also this divine Christ character, but do you have any evidence? If Jesus is God, and God is beyond our comprehension, how can you possibly trust him? If he is God, then that implies that you understand him enough to place your trust in him, which means that you must understand him a whole lot indeed unless you simply give your trust to everything. If we're both imperfect, why should I believe anything you have to say over my own understanding of things? That is up for you to decide. I'm just saying what I believe. It is not up to me to make you believe anything. If you are like a computer, and that computer is imperfect, would you trust it's calculations are accurate? You, an imperfect being, have concluded that a perfect being does exist without benefit of any evidence to support your conclusion. Why should we trust you? I know. His disciples – his closest friends – deserted and denied him when he was crucified. Jesus didn't apologize for over-turning the tables – I think he believed his actions were justified. Don't trust me. Do what you want. I'm not a computer. Or a robot. I'm a human being. I believe I was created to be in a relationship with my Creator. We call him our "Heavenly Father" – He is like a parent. And I don't believe what you say you believe. That's how atheism works. We simply don't take people's claims on faith. People make all kinds of mistakes believing that those actions were justified. That just makes Jesus human. I used to be an atheist. That is not how atheism works. It just meant I didn't believe in God. I think by perfect, people mean he neverd did anything wrong in the eyes of God. "Perfection" is an abstract concept, correct? Can there ever be an actual thing that is perfect? Probably only a deity make a claim of perfection. Or anybody making a claim about a deity being perfect. Just because I can say something like "The square triangle" it doesn't make such a thing true, or even possible.